More than 10 months after a group of young women began living with members of the Sisterhood of St. John the Divine (SSJD), the inaugural Companions on the Way program is drawing to a close—an experience that left a major impact on sisters and companions alike. The sisters officially commissioned five companions in September 2016: Christine Stoll, Sarah Moesker, Amanda Avery, Hanné Becker, and Alisa Samuel, though the latter three were unable to stay for the entire duration of the program. During their time at the SSJD’s Toronto-based convent, the companions joined in living the monastic lifestyle of the sisters, devoting their days to work, study, prayer, and spiritual contemplation. A typical day for the companions began at 6 a.m. with two hours of personal prayer. After eating breakfast, they attended morning prayer in the chapel before devoting time to various work projects. Afternoons were filled with study and rest. The companions each took part in two courses at Wycliffe College during the fall and winter, and also pursued independent studies. Occasionally companions would contribute to a blog documenting their experiences. Dinner and cleanup preceded evening prayer and rest time. Reflecting their diverse backgrounds, each of the companions had a unique experience at the convent. For Stoll—previously a teaching assistant in mathematics at Douglas College in Port Coquitlam, B.C.—work experience included gardening and carrying out tasks in the chapel, such as filing papers and refilling the oil lamp. “I think living here, for me, it’s been good and healing,” Stoll said. Having spent recent weeks debating what to do after the program ends, she is leaning towards returning to her work as a teaching assistant. During the first half of her stay at the convent, Moesker spent much of her time working in the kitchen. The latter half saw her providing pastoral care at nearby Sunnybrook Hospital, visiting patients and gaining a sense of their varied spiritual needs, as well as taking care of simple tasks such as delivering newspapers and watering plants. She described her time at the convent as “stabilizing” and clarifying her post-graduation plans. As she concludes the program, Moesker takes away a renewed sense of spiritual discipline, appreciation for the value of closing her day with prayer, and improved skills in navigating relationships with others. “I think being here and sort of being forced to interact with the same people constantly—somehow it makes it a safe place to figure out healthy boundaries, to figure out communication,” she said. 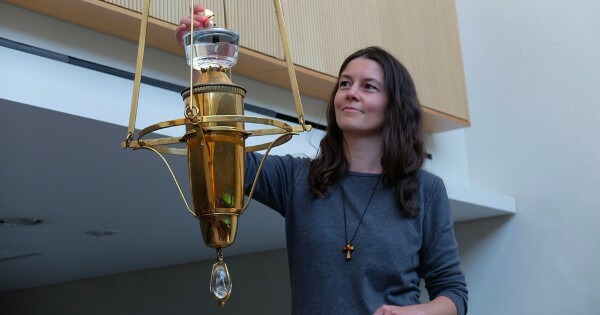 Convent life was particularly impactful for Amanda Avery, director of the Ready-Set-Go program for low-income children in Halifax and an Atlantic School of Theology student who is seeking to become an Anglican priest. She described her time in the program as “exciting, stressful … yet joyful”. “It has been a roller coaster of a ride … The experience has changed me and has given me new insights and new ways to look at not just God, but myself and my community and the people that are in my community,” Avery said. The majority of Avery’s time was spent at St. John’s Rehab with the sisters and the Rev. Joanne Davies, who serves as chaplain to the Sunnybrook Health Sciences Centre. During this time Avery visited patients and took part in the hospital’s therapy program. She said the experience tailored her to look at a different kind of ministry than that of a parish priest. For the sisters, the experience of living alongside the companions was a positive one. “I think it brought us a lot of good energy, living with younger women, and opening us up to living with younger people,” Sister Elizabeth Ann Eckert said. The degree to which the companions integrated surprised even the sisters. Though the companions were originally allotted time each morning to hold a conference amongst themselves, they ultimately chose to join the sisters at that time—an arrangement that “worked much better,” Rolfe-Thomas said. Highlights for the sisters included the evening prayers put together and formatted by the companions, as well as an Agape supper chiefly organized by Avery but in which all the companions helped out. With the successful completion of the first Companions on the Way program, the SSJD now plans to take time to evaluate the experience. The sisters meet in chapter annually, and Companions on the Way is slated to be a major topic at their August chapter meeting. For the 2017-2018 season, Companions on the Way will be folded into a similar SSJD program, Alongsiders: Living in God’s Rhythm. “We feel we need a year to evaluate the [Companions on the Way] program and see if there are changes we want to make in it, rather than just flowing from one to the next,” Sister Constance Joanna Gefvert said. Nevertheless, Rolfe-Thomas said, the Companions program will “go ahead in some form”. Thank you for your very interesting & informative writing on “Companions on an ancient path”. There was no other way to find out about how they spent their daily lives, & the work they did, how they enjoyed it, what is going on now, what the hope is for the future of this unique experience for others to pursue.